Do you have photos, historical accounts or other items pertaining to the Pierz area? Would you like to share this historical information with the world? 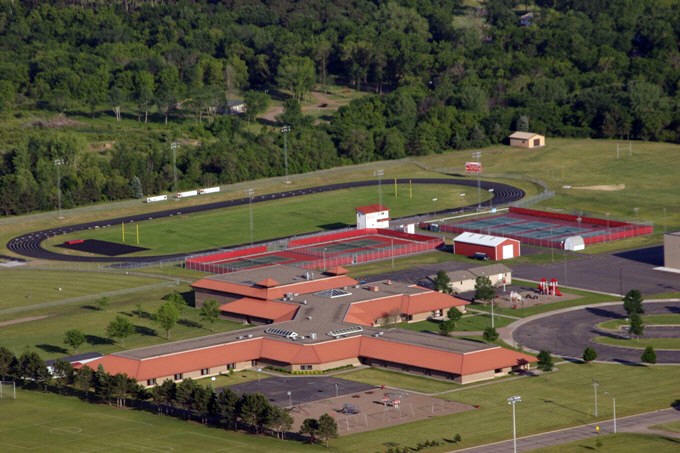 LakesnWoods.com would like to publish your Pierz photos (current or historical) or historical accounts on this website. Original materials can be returned and your privacy will be respected. Pierz is in the heart of Central Minnesota. Originally settled in the 1860's by German Catholics, the area has become a blend of cultural backgrounds. One of the most beautiful spots in Pierz is the naturally landscaped, 9-hole golf course with its clubhouse and pro-shop. 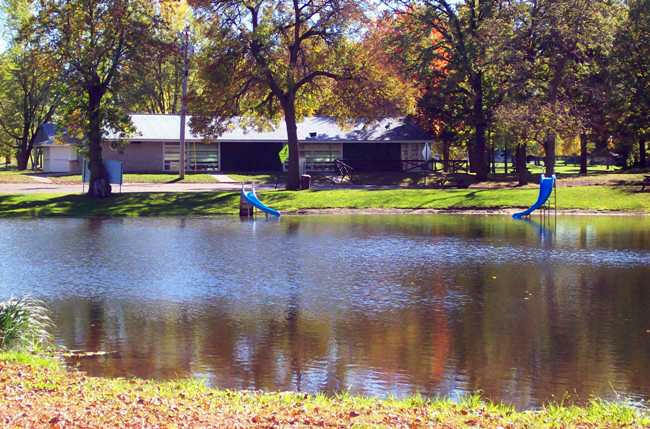 The adjoining park/campground offers two large picnic shelters with kitchen facilities, updated camp sites, a swimming beach, basketball court, new horseshoe courts, and a playground! The Pierz Legion Ball Park is a sight to see! It features a lighted baseball field complete with sprinkling system, grandstand, and adjoining practice field. Pierz Healy High School's lighted tennis courts are open to the public. The former Soo Railroad Line has found a new life as a snowmobile and ATV trail spanning from Genola to Duluth. Part of Morrison County's 250 miles of groomed snowmobile trails travel through Pierz where snowmobilers are always welcome. The community is supportive of education for all ages. The blend of public and private quality elementary education, combined with quality high school programming makes District 484 an award winning district. A stable and diverse economic base has supported Pierz throughout its history. Businesses ranging from hardware to hair care line our mile long Main Street. Pierz is a progressive community committed to providing an environment conducive to success. 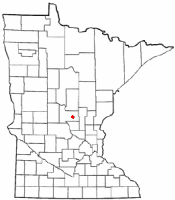 Pierz is a city in Morrison County, Minnesota. Minnesota State Highways 25 and 27 are two of the main routes in the city. According to the United States Census Bureau, the city has a total area of 1.35 square miles (3.50 km2), all of it land. The elevation is 1,175 feet (358 m) above sea level. As of the census of 2010, there were 1,393 people, 585 households, and 339 families residing in the city. The population density was 1,031.9 inhabitants per square mile (398.4/km2). There were 605 housing units at an average density of 448.1 per square mile (173.0/km2). The racial makeup of the city was 98.6% White, 0.1% Native American, 0.2% Asian, 0.1% from other races, and 0.9% from two or more races. Hispanic or Latino of any race were 0.6% of the population. There were 585 households of which 29.4% had children under the age of 18 living with them, 42.2% were married couples living together, 11.8% had a female householder with no husband present, 3.9% had a male householder with no wife present, and 42.1% were non-families. 37.8% of all households were made up of individuals and 25.7% had someone living alone who was 65 years of age or older. The average household size was 2.23 and the average family size was 2.94. The median age in the city was 42.5 years. 24.5% of residents were under the age of 18; 7.1% were between the ages of 18 and 24; 21.2% were from 25 to 44; 19.8% were from 45 to 64; and 27.3% were 65 years of age or older. The gender makeup of the city was 41.3% male and 58.7% female. 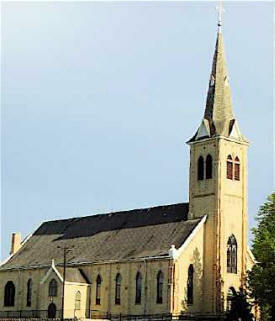 PIERZ Township, organized March 9, 1869, was named in honor of Francis Xavier Pierz (or Pirec), a Catholic missionary. He was born in Godic, Carniola, Austria, November 20, 1785; was ordained a priest in 1813; came to the United States in 1835; was a missionary to the Ottawa Indians in Michigan and from 1852 to 1873 labored mainly among the Ojibwe in northern Minnesota; was a leader in forming the Benedictine community of St. John's, Collegeville, and in bringing German colonists to Stearns and Morrison Counties; returned to Austria in 1873 and died in Laibach, Carniola, January 22, 1880. The city in section 8 of Pierz was platted in 1891, was incorporated as a village on August 17, 1894, and separated from the township on October 21, 1916. 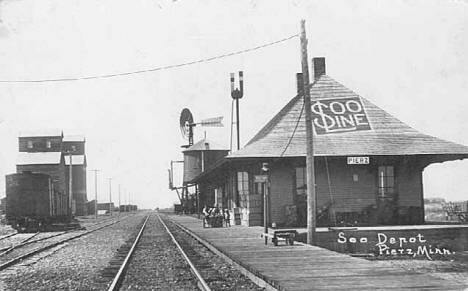 The post office, began in 1870 in the home of postmaster Frank Konen, located in section 28 of Buh Township, was called Rich Prairie, 1876-92, and was moved into the village in 1878; the village had a station of the Soo Line. Pierz Fish Lake is 2 miles West of Pierz. The lake is 170 acres. The Littoral area is 65 acres. The maximum depth is 34 feet. The water clarity is 6.5 feet. 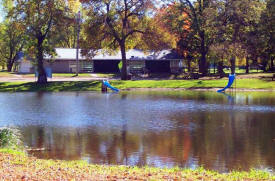 Pierz Fish Lake is open to the public with a concrete access landing on the lake's west end. 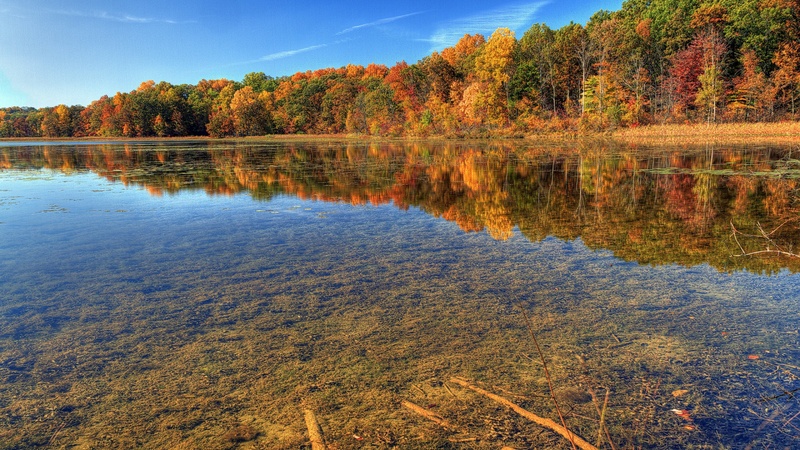 The lake includes such fish as Crappie, Largemouth Bass, Northern Pike, Sunfish, and Walleye. To build a sewage plant or a golf course was the question Pierz had to answer during the 1930's while the United States was in the throes of the Great Depression. 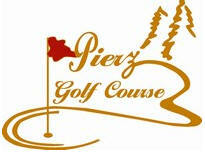 The town fathers opted for the golf course and the outstanding Pierz Golf Club is the result. Today this remarkable nine-hole course is one of the scenic marvels built by 75 men who worked for the Works Progress Administration (WPA) from 1932-1935. In one of the few remaining nine-hole layouts in Central Minnesota, the mature Pierz Golf Club is an aesthetic masterpiece. The two par-three holes are the course's heart and soul. The finest is the fourth, a 166-yard par three with a slow-moving stream that fronts the tee and an undulating green that can be devilish to putt if one is above the cup. The Soo Line South ATV Trail is a 114-mile trail which runs from Genola, Minnesota to Saunders Junction, Wisconsin (near Superior). The trail is very scenic and includes a mix of forested areas, farmland, and streams. 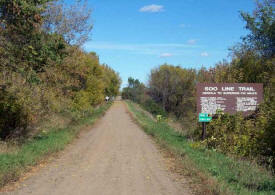 The Soo Line South ATV Trail connects with the 148-mile Soo Line North ATV Trail, southwest of Moose Lake. Essentia Health St. Joseph's - Pierz Clinic provides family practice healthcare to the local community. Throughout the years, we have expanded our services to best address our patients' needs. The Pierz Shopping Guide serves the cities of Pierz, Genola, Buckman, Harding, Lastrup, portions of Hillman and the surrounding rural areas. The publication is free and delivered by USPS to every residence that receives mail in the above referenced areas. It is mailed to arrive in homes on the 1st of each month. 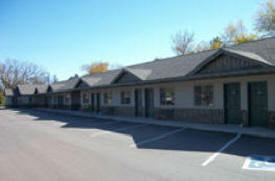 Hillbilly Haven Motel, located in Pierz, MN, is your trusted affordable motel. Since 2008, we have been providing our customers with an affordable and enjoyable place to stay. We have nightly and weekly rates available to make your stay easy on your pockets. We have 10 clean, comfortable and all-non-smoking rooms, available. Call us today. In addition to the fine course, golfers and non-golfers alike can enjoy the adjacent campground site, too. To have a campground next to the course is a unique plus since it can accommodate 38 overnight campers with water and electrical hookups at each site. 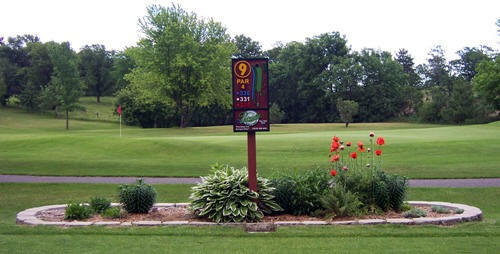 Camping/golfing packages are available to families. The site has a new shower house and upgraded playground facilities. Moreover, two shelters can be rented to host parties, reunions and weddings. We assist families who have suffered a loss through death with the utmost respect, dignity, love and care. We are committed to providing families with a funeral experience which honors their loved one by “Cherishing Memories - Celebrating Life”. Emblom-Brenny Funeral Service provides a long tradition in funeral service of independent family-owned funeral homes. Since 1908, Farmers & Merchants State Bank of Pierz has been a cornerstone of the community. In 1995, we opened our Sauk Rapids, MN office, extending our reach in Central Minnesota. For nearly 100 years, Farmers & Merchants State Bank of Pierz has been a leader in offering financing solutions to individuals, farmers, and local businesses. Faust photography started in 1996 in a home based studio. Since then we have built a new studio 7 miles north west of Pierz. We have a great out door Studio and huge indoor studio now, to fit all your photography needs. Please come picture the difference at Faust Photography. Call 320-468-2345 for your free consultation. Harding Place of Ave Pierz, MN is a country-like home designed for those in need of 24 hour personalized care and assisted living services. We encourage resident involvement in all aspects of daily living. We provide large living areas to provide residents with the opportunity to pursue leisure activities such as pool, puzzles, visiting, reading, gardening, and more. The Harmony House of Pierz is located in a quiet residential setting with state of the art health care providers and services conveniently located nearby. The Pierz Harmony House consists of two homes connected by a beautiful enclosed outdoor patio area for our Residents' enjoyment. Each home houses ten residents, offering both private and semi-private rooms. The Insurance Shoppe in Pierz, MN provides professional insurance services. We offer fast free quotes. No service fee on small work comps and risk auto policies. For over 30 years, Kowalczyk Gravel Inc. has served as Central Minnesota’s premier excavating and demolition contractor. Our locally-owned and operated business works with residential, commercial and industrial clients on a wide range of projects. We proudly serve Little Falls, Pierz, Royalton, St. 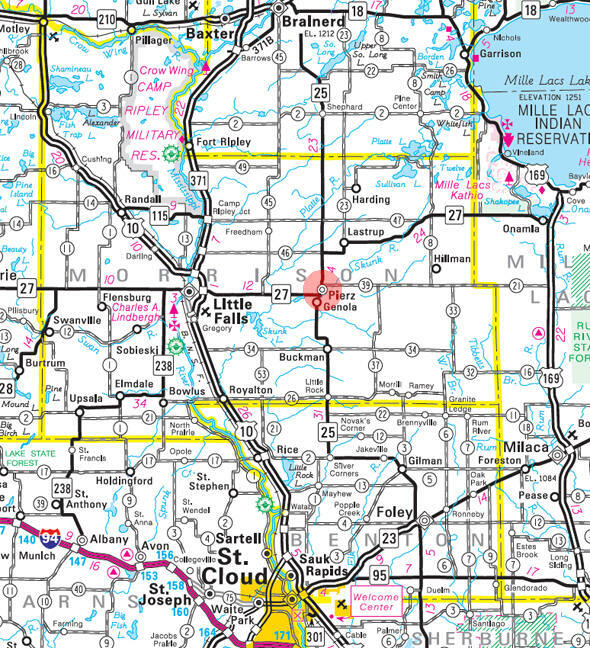 Cloud, Brainerd lakes area, Garrison, Long Prairie, and the surrounding communities. North Star Tree Care combines expertise with safe practices to provide the best tree care services for property owners throughout central Minnesota. With a decade of experience and a full line of state-of-the-art and specialty equipment, North Star Tree Care has everything it takes to remove diseased or unwanted trees, keep trees properly pruned, manage overall tree care, and make trees beautiful. Our Pellets are made from the finest wood fibers Minnesota has to offer. 100% Hardwood Blend of Oak, Hickory, Maple, Cherry & Ash. No softwood in our pellet. We have been serving the people of Minnesota for over 4 years. Let's keep pellet burning local. Buy local. Buy Oak Creek Pellets. Pierz Family Dentistry located on Main Street in Pierz, Minnesota, is the office of Dr. Andrea and Dr. Chris McGrew. It is conveniently located on Highway 25 in downtown Pierz. Daily deliveries to all area schools, hospitals, and funeral homes. 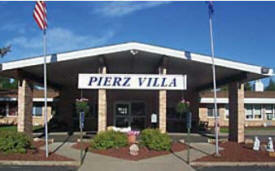 Since it opened in 1961, Pierz Villa has been devoted to caring for the whole person in a friendly home-like atmosphere. Private and semiprivate rooms are available to meet each person's needs. Residents, staff and family work together to develop an individual plan of care to assure that the physical, psychosocial, spiritual and recreational needs of the residents are met. We are dedicated to providing a living situation where each person's dignity and independence is respected. 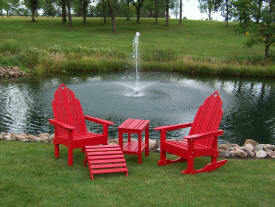 Prairie Leisure Design manufactures casual outdoor furniture. Our products have a traditional design and are made in the U.S.A. from Spanish Cedar or a North American hardwood, Aspen. We have a wide variety of products designed for every age group: elderly, adults, juniors and kids. Prairie Leisure Design furniture is great for relaxation and socialization. It also adds comfort, style and quality to any backyard or patio. Rich Prairie Chiropractic Center Inc. is a health and wellness clinic in Pierz, MN specializing in chiropractic services. We are a full service facility offering fast and effective pain relief to common ailments such as back and neck pain. We provide chiropractic care, corrective exercises, and spinal screenings at affordable rates. Our experienced team of chiropractors is here to provide aid as we help you find the source of your problem and provide an effective treatment and speedy recovery. We have utilized gentle and effective techniques and modalities as an alternative to drugs and surgery for muscular and spinal problems. At Rich Prairie Livestock Exchange, where buyer competition is at its best, we sell hogs and all classes of cattle. On Mondays we sell butcher hogs, sows, and boars followed by all classes of baby and started calves, Holstein beef calves, bred beef cows, fat cattle, slaughter cows and bulls. Sales are held every Monday. The Rocking T is a riding school that helps people learn the "nature of horses", thus solving problems so the horse and rider can be safe and have fun! Learn holistic alternative health care for horses. Reserve private time for lessons, or for facility use. 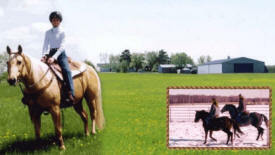 Orientation lessons at the indoor arena prepares new riders for the trails out to the beaver ponds and hills overlooking wildlife habitat of the undisturbed Black Brook. 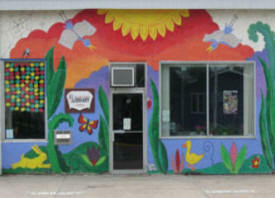 We are located at 227 Main St N in Pierz, Minnesota, in eastern Morrison County. We have been serving central Minnesota’s insurance needs since 1963. We are an independent insurance agency able to insure just about any insurance need you may have. We are also the only truly local insurance agency in Pierz. Shelley Funeral Chapels has been privileged to serve families for over 75 years in Central Minnesota. Our experienced and professional staff will provide you with caring and compassionate service during a difficult time. We are committed to guiding you through the appropriate arrangements for a funeral that is meaningful to you and your loved ones. Shelley Funeral Chapels is dedicated to serving our community with the utmost dignity and respect. It's something we've always done and always will. We are "Friends Helping Friends". 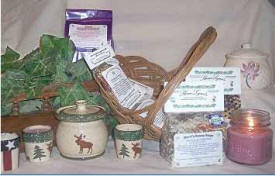 SherriLynn's is a cottage business nestled in the heart of Minnesota, just outside of Pierz. Dedicated to "Minnesota and its Agriculture", Sherri is a very unique "gourmet chick and chandler" and has created a gourmet food and candle line that includes "Minnesota Grown" grains, herbs and vegetables and beeswax. This is a one of a kind Minnesota business that includes a piece of Minnesota in every product made. Our goal is to provide you with all your banking needs and to give you the best service possible. Please stop by one of our locations and meet our friendly staff of people ready to meet all your banking needs. We are pleased to offer a variety of services including Internet Banking, Telephone Banking, Bill Pay and E-Statements. Les and Maxine Wolff are proud to offer you a variety of Natural Health Products, Herbals, Vitamins, Minerals, non-prescription medications, and a selection of Alternative Products -- including SeaBand and Copper Bracelets -- for your at home shopping convenience.